Figure 3. Stone platform (building level 1). clearly identifiable structures, at no more than five per several hundred square excavated meters in each level, is also relatively small. Even if we make the highly debatable assumption that all of the exterior plaster expanses that do not abut stone structures are in fact the traces of other freestanding structures, it is still very hard to justify the premise that the site encompassed a total number of structures much higher than the teens at any one time. Thus, it seems unlikely that Hallan £emi was inhabited by a community very much larger than that thought to characterize mobile hunting-gathering bands (cf. Lee and DeVore 1968). However, despite the community's relatively small size and essentially hunter-gatherer subsistence base, certain key elements that characterize the organization of later, larger, Neolithic sites (e.g., Cayonu, Beidha) are already evident at Hallan £emi. At the most basic organizational level, the entrances to structures in all levels of the site generally face away from the central (i.e., communal) activity area (Figure 1).As noted by Yellen (1985, 1990), with respect to similar layouts in the camps of some !Kunggroups that have recently begun to practice pastoralism, this is a departure from the layout characteristic of mobile hunter-gatherer camps. Yellen suggests that it is adopted to enhance household privacy and associated with the abandonment of generalized reciprocal sharing of the type that characterizes mobile hunting-gathering lifeways and its replacement by the more restrictive networks for sharing (see also Byrd 1994:649)that develop in response to the institution-alization of private economic property. At the community level, public buildings and the new social structures they represent are a consistent feature of later Anatolian Neolithic sites, such as Cayonu (Ozdogan and Ozdogan 1989; Schirmer 1990) and Nevali £ori (Hauptmann 1993). 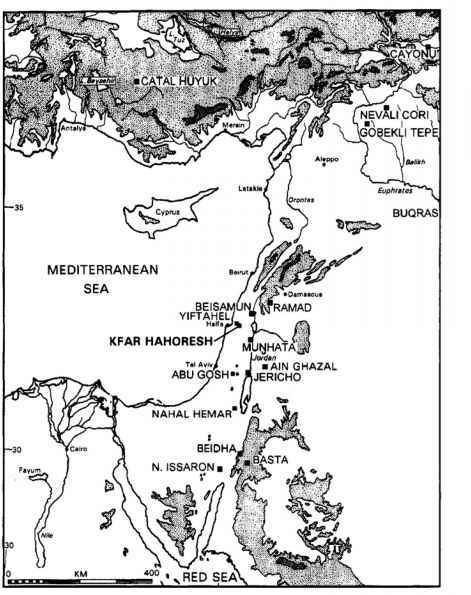 In the Levant they are also present, not just at later sites, such as Beidha (Byrd 1994),but at very early sites, such as 'Ain Mallaha (Perrot 1966) and the PPNA tower of Jericho, which Bar-Yosef (1986) and Kuijt (1996) view as a communal constructions probably employed for ritual. Therefore, it is not surprising that public structures are also apparently present at Hallan £mi. While the case for the large level 2 paved structure (Figure 1F) being a public building is relatively weak, revolving primarily around its size (but see Byrd 1994:646), the case for the two large semisubterranean buildings (Figure 1A, B) in level 1 being public buildings is much stronger (see Rosenberg 1994a;Rosenberg et al. 1995). First, they are approximately three times the size of the contemporary smaller stone structures and similar in area to what Byrd (1994:646) proposes to be public buildings at Beidha. Second, the interiors are also distinctive, with frequent resurfacing of the floor and distinctive architectural features such as platforms/benches. There is also the general dearth of food-processing equipment in these structures and the presence within one of the only clearly identifiable obsidian-pro cessing area in the site. 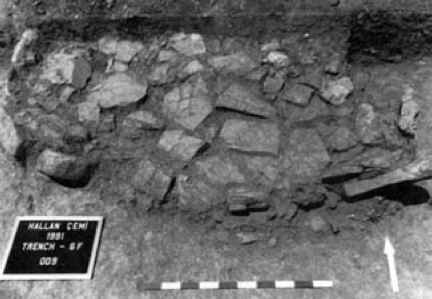 The occurrence in the vicinity of these two structures of virtually all the copper ore fragments found at the site is also a point of distinction and a further indication that the activities carried out in and around them were not domestic in nature. Lastly, the obviously symbolic nature of the aurochs skull that once hung opposite the entrance to one suggests that the group using this building was sufficiently important to be symbolized. The presence within the other semisubterranean structure of several sheep skulls (whether or not they once hung on its walls) is also intriguing. A snoted, three other such skulls were found neatly aligned in the central activity area (Figure 4). Whatever the meaning of this open-air skull alignment, it was produced by a purposeful public act, raising the possibility that the sheep skulls found in this second public structure also reflect some facet of the public domain (see Goring-Morris, Kuijt, and Rollefson, all this volume). Figure 4. Linear arrangement of three sheep crania in central activity area. buildings may have controlled rights to either or both of the community's real property (communal lands) and intellectual property (practical, sacred, and supernatural knowledge). In that vein, several points regarding the Hallan Cemi public buildings are worth noting. First, in the only level (1)for which we have reasonably good evidence for the existence of public buildings, there are apparently two such buildings. Thus, there may very well be two suprahousehold groups in concurrent existence, despite the community's relatively small size. This differs from the apparent case at PPNB Beidha (see Byrd 1994:656) and another PPNB era site in eastern Anatolia—Nevali Cori (cf. Hauptmann 1993) —at both of which only one public building is in use at a time. The Cayonu data (Ozdogan and Ozdogan 1993), on the other hand, hint that this point of contrast may be indicative of a trend; there are two or more public buildings in concurrent use during the earlier subphases and only a single one (the terrazzo building) by the cell-plan subphase. Second, there is some evidence for control over practical knowledge, if not real property, by the group(s) using these public buildings. Both the copper ore and the obsidian were materials imported into Hallan Cemifrom some distance (see Rosenberg 1994a; Rosenberg and Davis 1992). Thus, the presence of otherwise rare obsidian cores in one of these structures and the general association of copper ore finds in and around both these structures suggest that, even if these suprahousehold groups did not control outright the long-distance trade in these relatively valuable commodities at Hallan Cemi,they played a central role in that trade. Lastly, there is some evidence for control of sacred/supernatural knowledge by these suprahousehold groups. This takes the form of the aurochs skull within one of these structures and the strong association between the symbolization of aurochs and the sacred domain in later Anatolian cultures (e.g., Mellaart 1967). The public buildings aside, the material culture assemblage from the site contains several categories of objects that very likely relate to the structural aspects of the inhabitant's culture. Included within this group are the numerous stone bowl fragments found at the site. These are made of a gray/green-black chloritic stone and white limestone, with the chloritic examples often elaborately decorated with incised designs in geometric and naturalistic motifs (Figure 5). Preliminary analysis suggests that the frequency of elaborately decorated bowls increases over time. Similartype stone bowls also occur in limited numbers at the nearby and somewhat later site of Cayonu (Ozdogan and Ozdogan 1993) and other, as yet undated, aceramic sites along the upper Tigris in eastern Turkey (e.g., Ozdogan and Ozdogan 1993:91).However, they do not seem to occur at roughly contemporary aceramic sites within the Tigris drainage in northern Iraq (e.g., Nemrik 9 and Qermez Dere). Figure 5. 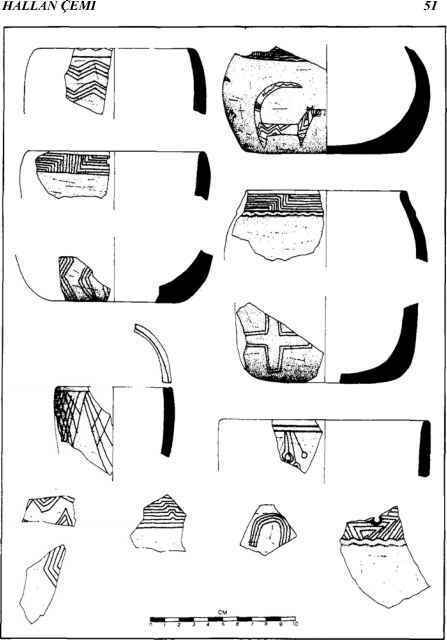 Stone bowls, showing selection of design motifs. Also included are a series of sculpted fancy pestles (Figure 6:1-7). These are most commonly made of the same chloritic stone as the bowls, but occasionallysandstone was used. The majority of both kinds have handles sculpted into a variety of naturalistic forms, stylized to varying degrees. Recognizable motifs include goats' heads (Figure 6:7), paired laterally projecting straight or curved flanges that may represent bovid horns (Figure 6:3-6), and one or more kinds of mammalian animal devoid of horns (Figure 6:2). As a type, these objects are clearly related to the sculptures found at the slightly later site of Nemrik 9 in northern Iraq (see Kempisty and Kozlowski 1990; Kozlowski,1989). The chloritic examples, particularly the sculpted examples, were extensively conserved, with new working ends continuously fashioned on the remaining broken handle portion, until such time as the pestle was too small for further use. The stone bowls were also highly conserved, though less extensively so than the sculpted pestles. Lastly, it should be noted that the stone bowls and sculpted fancy pestles, particularly those made of the chloritic stone, are typically made to the same approximate scale and were thus quite capable of being used together. Inasmuch as the aforementioned stone bowls and sculpted pestles were clearly labor intensive to produce and extensively conserved, they were clearly valuable objects. Moreover, the large majority of the pestles and a significant number of the bowls were decorated with motifs that, by virtue of their recurrence, presumably had symbolic significance. Their apparent value and their apparent status as vehicles for symbolization suggest usage in the ritualized preparation and consumption of food or drink, presumably in the context of special occasions. Given the extremely high frequency of stone bowl fragments in the overall site assemblage, the behavioral context in which stone bowl (and possibly associated sculpted pestle) usage occurred was apparently a relatively frequent occurrence. 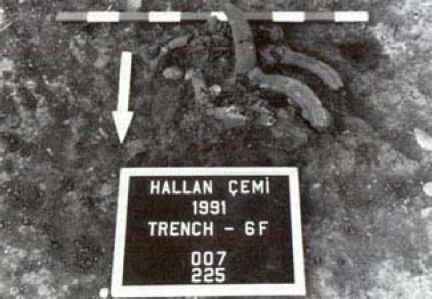 In that vein, the presence of extremely high concentrations of animal bone, including still-articulated portions of animal carcasses, and fire-cracked stone in the central activity area is worth repeating because Hayden (e.g., 1995:296)consid-ers them to be indicative of feasting. Figure 6. 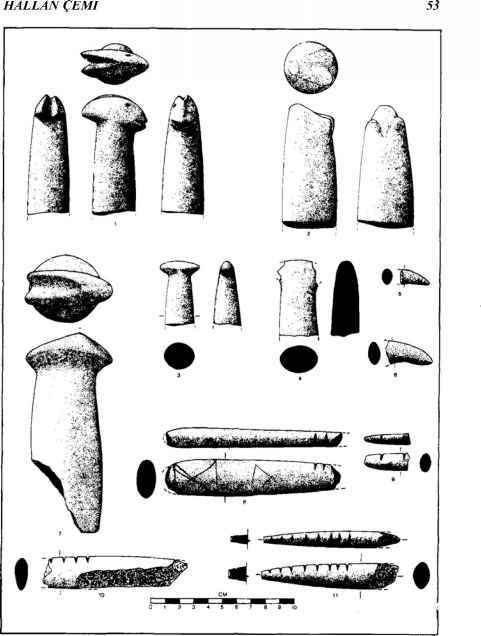 Sculpted pestles (1-7) and notched stone batons (8-111). signs of wear within them, nor is wear apparent on any other part of these relatively soft objects. The single reasonably intact example (Figure 6:8) is decorated with an incised hourglass design. Objects of this type seem thus far to be known only from Hallan £emi and can most readily be construed to represent formal tallies of some sort (see Rosenberg et al. 1995). If so, the tally system's very formality implies that these records are of events having sociocultural significance. The specific things being tallied are probably not knowable archaeologically. However, socially significant events can be broadly categorized as falling under the general heading of either things done or things given. The third possibility is that these tallies represent things owned. It is also the most remote, given that the ethnographic record indicates that amassed wealth is socially significant in only the most complex societies. Needless to say, if this is what these tallies represent, the behaviors they imply are a most dramatic departure from the mobile hunter-gatherer norm. If these records represent things done, then, to the degree that individual actions or achievements in any given cultural domain are recorded, they are noteworthy and thus a potential source of political power (e.g., see Lee 1969). This is a clear departure from the fiercely defended egalitarian ethos of mobile hunting-gathering societies, with its strong tendencies toward publicly playing down individual achievement for precisely that reason. On the other hand, if these tallies represent things given, then, to the degree that giving or receiving is being recorded, this is a departure of the generalized reciprocal sharing that dominates mobile hunter-gather exchange. Thus, they would constitute evidence for the existence of at least some balanced reciprocal exchange systems at Hallan £emi. In either case, these notched stone batons, to the degree they can be considered tallies, are indicative of profound departures from the sociopolitical and socioeconomic systems that characterize mobile hunting-gathering groups.